This is the DVD with the greatest master pieces of Mr. Kenzo Masaoka ! Kenzo Masaoka is an animator who represents the early period of Japanese animation history. Although there were a few other artists who created animated films before he does in Japan. He is known as the first person who created many sophisticated animation shorts at the world war II period. Furthermore he is the animator who trained Yasuji Mori to become one of the greatest animators, therefore this means that he can be one of the first people who started Japanese animation history. Because of this he is called “The father of Japanese animation”. Therefore this is the vital reference to study about Japanese animation history, and Japanese culture in world war II. 01 Benkei tai Ushiwaka/ Benkei vs Ushiwaka 1939 14min. 02 Kumo to Tulip/ The Spider and the Tulip 1943 16min. 03 Sakura (Haru no Genso)/Cherry blossom (The Illusion of Spring) 1947 8min. 06 Sute-neko Tora-chan/ Tora-chan, an orphan kitty 1947 21min. 07 Tora-chan to Hanayome/ Tora-chan's wedding 1948 17min. 08 Tora-chan no Kankan-mushi/ Tora-chan's ship sweeper 1950 10min. Language: Japanese only. Any subtitle is not included. *There would be a little problem of the picture and sound because these films are very old and partly damaged. 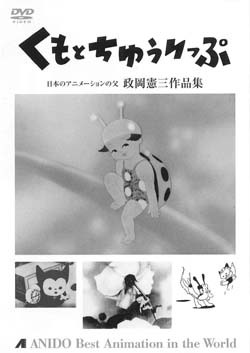 Masaoka tried operetta style in this film.